Bigger size for those who need more space to write and organise themselves! 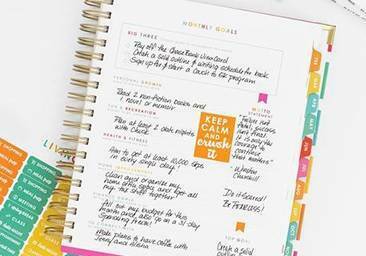 The Create 365 Happy Planners (creative agendas or personal organisers) will allow you to keep track of your daily activity and tasks, but also to fill them with cuts, stickers and photographs making them the perfect companion for your most memorable moments. Write down every detail from your travels or your mundane activities. A creative planner is ideal to combine your creativity and your organisational needs. This planner’s rings will allow you to add and take out pages easily. This way, they working process will be much more comfortable, you could decorate a page and add it again when you are done. Contains pages and separators for 12 months. They come undated so you can start your year whenever you want! The cover and back cover are laminated for a better preservation, making possible to carry around the planner safely! - Resistant laminated cover and back cover. - Stickers for every month. - Monthly calendars (weeks start on Sunday). - Weekly calendars (weeks start on Monday). Every day of the week ids divided in three different sections (with vertical organisation). - Includes details in golden foil. Cover’s size: 22,86x28,57 cm (9"x11.25"). Interior’s pages size: 21,59x27,94 cm (8,5"x11").